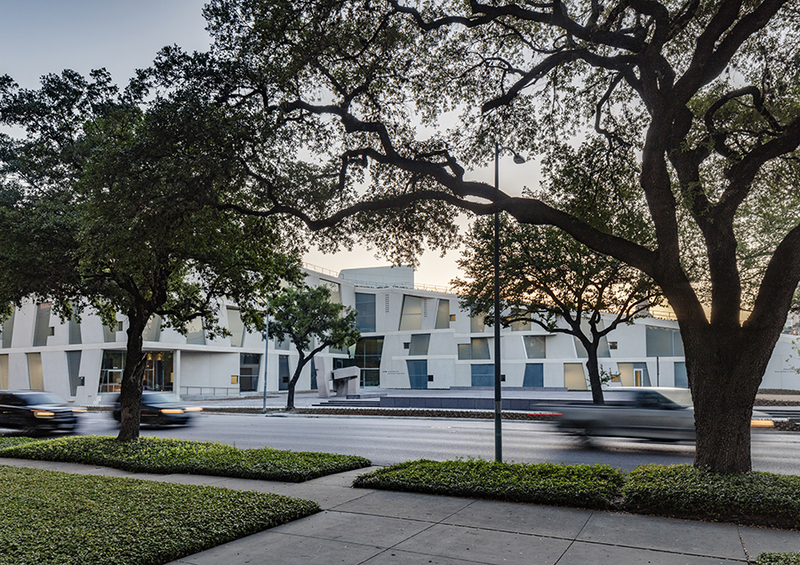 On May 20, the Museum of Fine Arts Houston (MFAH) will open the first phase of its campus redevelopment project with the inauguration of the Glassell School of Art, designed by Steven Holl Architects. The building is the first of three to be realized as part of the museum’s $450 million expansion of its Susan and Fayez S. Sarofim Campus. 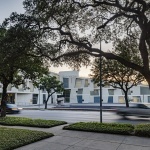 The remaining two buildings are in construction—the Nancy and Rich Kinder Building, also designed by Holl, is expected in early 2020, and the Sarah Campbell Blaffer Foundation Center for Conservation, designed by Lake|Flato Architects, is expected by late 2018—along with an underground parking garage and connecting tunnels. 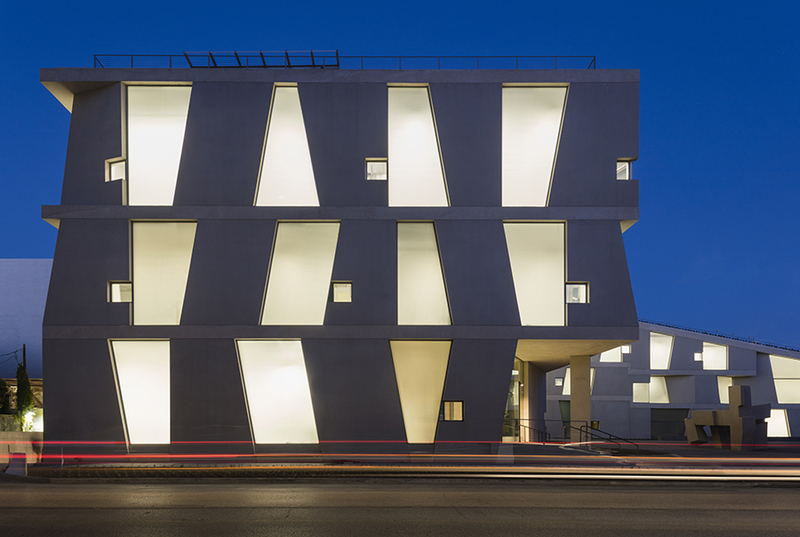 The new Glassell building, largely programmed as classrooms and exhibition spaces, doubles the size of its prior building, which was demolished to make way for the campus expansion. 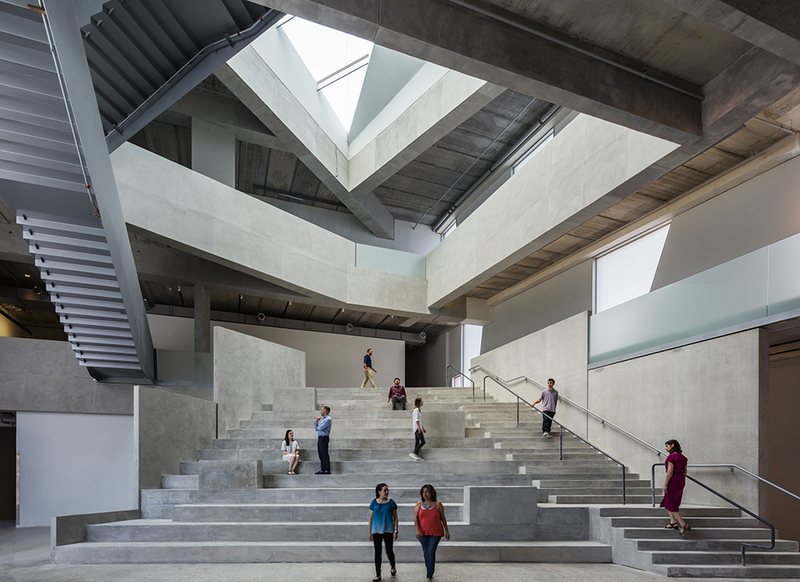 According to architect Chris McVoy, the Glassell School is a campus building formed in response to the institution’s public outdoor spaces. The L-shaped form faces Montrose Boulevard but is set back from its edge, creating a plaza that extends the Cullen Sculpture Garden by Isamu Noguchi to the north, defining a northern edge on the campus. The sloped roof extends the landscape up to the BBVA Compass Roof Garden, an outdoor space that provides views of the Brown Foundation Plaza and the city beyond. Structured over below-grade classrooms and underground parking, the plaza, designed by Deborah Nevins & Associates, takes cues from the Noguchi Sculpture Garden. 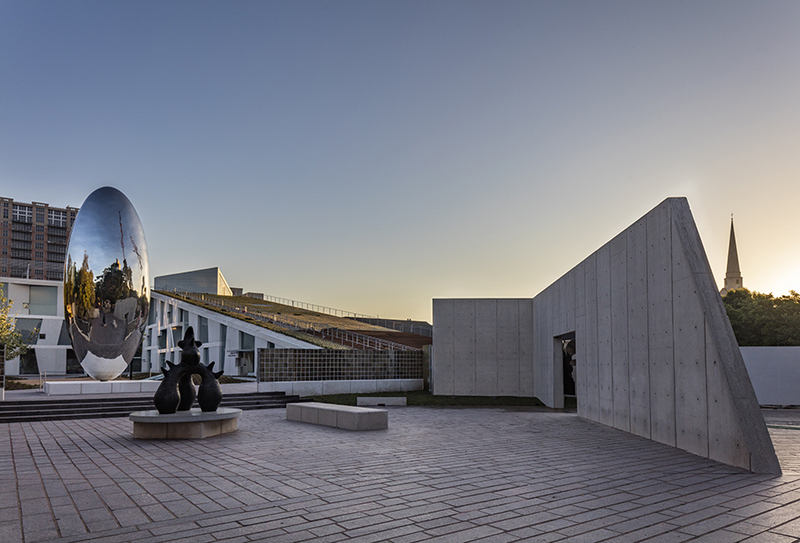 Its south end is anchored by Anish Kapoor’s Cloud Column (1998–2006), and Eduardo Chillida’s Song of Strength (1966) is installed on the north side close to the café entrance. In the middle, a grove of Mexican sycamores and a fountain provide recreational space. 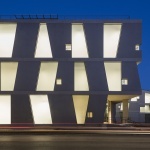 The exterior of the Glassell School is the most striking aspect of the building, realized with Guy Nordenson and Associates as structural engineer in coordination with Cardno Structural Engineering, and Kendall Heaton Associates as Architect of Record. 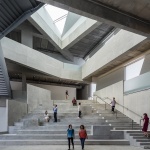 Its primitive stacked pieces of sandblasted concrete also act as structural supports (the 178 precast elements were made by Gate Precast, the same Texas company that fabricated the facade of the Perot Museum of Nature and Science in Dallas by Morphosis Architects). 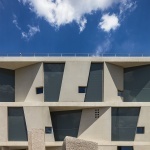 The facade’s color was selected to work with the limestone materiality of the campus, which includes buildings by Mies van der Rohe, Rafael Moneo, and Carlos Jiménez. 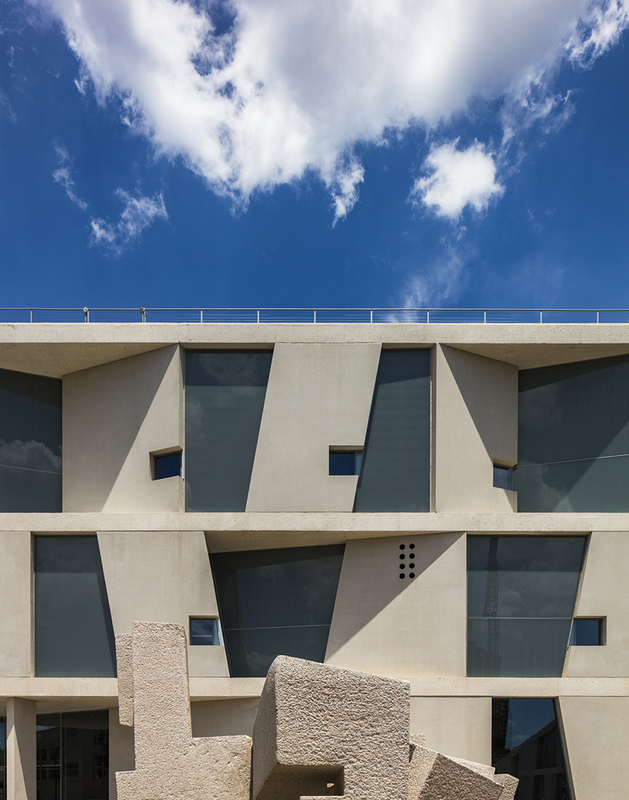 Using the 11-degree slope of the roof as a geometric starting point, each facade panel is angled on its long side, establishing a vocabulary of shapes for the lithic figures. Select panels are tilted, creating relief in the facade and casting shadows across the glazing. 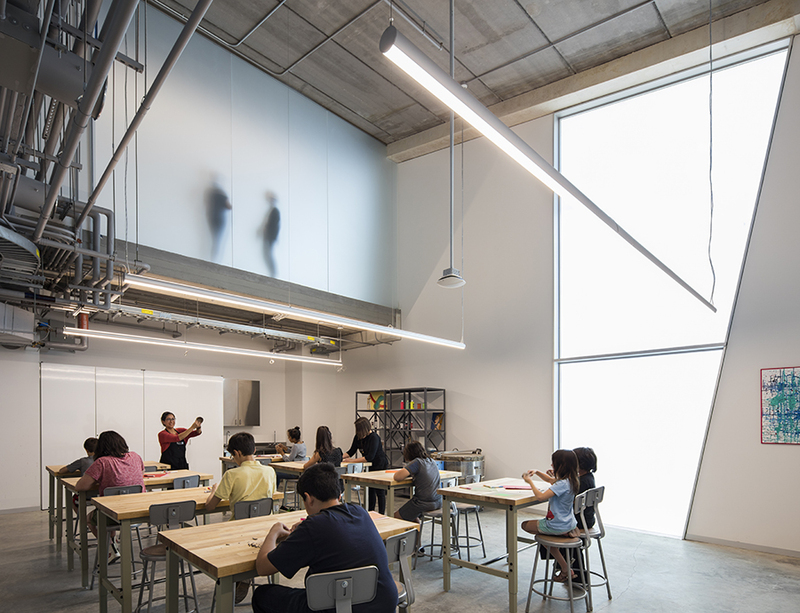 Each enormous piece of translucent glazing illuminates art-making spaces with diffuse light and is augmented by a square operable window. 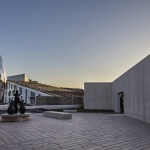 The design continues Holl’s interest in porosity but scales up to its current stacked stone expression. The Glassell might be the “most tectonic building we’ve ever done,” McVoy said. Inside, the spaces are spare but full of light, realized in white, shades of gray, and translucent glass. After entering through the interior corner vestibule, the forum space—another example of Holl’s facility in shaping spatially complex atria—is illuminated from above and works as a circulatory hinge between the two perpendicular wings. Here, visitors access upper floors, performances can be staged, and large-scale artworks can be installed. Above, independent steel stairs cross the void on their way up to the roof. Classrooms and a small auditorium are finished simply, with many rooms open to bottom of the precast concrete planks that structure the floors. The Glassell’s architecture operates in a contextually contradictory manner, in that it takes material cues from the campus but expresses them in its own articulations. Holl’s work shares a structural expressionism with Mies’s building; both projects show how they stretch their respective technical limits. It’s all about “using the technology of your time to get down to the simplest elements and put them together with the most advanced technology,” Holl said. So while Mies utilized steel and glass, the new Glassell advances a massive construction method. “Energy is more important today than structure,” Holl explained. 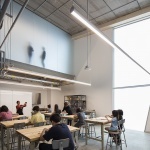 The thermal mass and radiant heating and cooling loops within topping slabs indicate that this concern has been integrated—light, energetic performance, and structure are part of the united expression at work in the Glassell building. If it is energy the architects are after, then the building seems poised to deliver. It will soon host thousands of students of all ages learning artistic skills, and countless more citizens who will claim its plaza as a new public terrain in Houston.